Hello again, super awesome Regency Lovers! We at Tea For Three Studios have just had our latest cyber meeting (random titbit: they usually happen on Fridays), and now have a few announcements to share with you. Melody and Jenny have been working on the next update, which will fix most of the bugs that have been flagged. This update is taking a while because they are also working on a proper iPad version, which means cleaning up some images for higher resolutions, and fiddling with screen space for the optimal iPad interface. We will also be including an in-game bug-reporting feature, in case there are any nasties we’ve not managed to squash this time round. We can’t give you an exact timeline, but hope to have the next update available in two months or so. Since mentioning there’s something Sutton-related in the works in our FAQ, we’ve seen a number of speculations across the Interwebs, travelling almost as quickly as gossip generated by Mrs Norris. Although we really want to say more about the shinies, we’ve decided to keep things under wraps until we’ve created a substantial amount of the work. Currently, we’re estimating a full announcement by mid-2016, and for the product to be launched in late 2016. This particular project involves something we’ve never done before, so we hope it’ll go smoothly, and that you’ll eventually enjoy our humble offerings. Samantha will be in Sydney next month, so the team will be in the same country again for a bit! As such, we’ve decided to get together and have a mini-release party for Regency Love 2.0 on Friday, 18 September 2015, where we’ll be consuming celebratory cake (and perhaps some tipple) at Tea For Three Studios’ headquarters. If you’re looking for an excuse to eat cake, we’d love you to join us! We’ll also be hanging around Twitter and possibly Facebook to chat about Regency Love and to answer any potential questions—more details to come. And that’s all for now. Have a great weekend! It’s been two months since we released Regency Love 2.0, complete with Mr Graham’s story, and we’ve been so pleased with all the feedback we’ve received. We have read and delighted in your comments and emails, and want to thank you for being so super supportive and awesome—especially with regards to a new character. 😉 We’re particularly grateful towards everyone who has helped spread the word, or who has decided to make a donation with the in-app patron letters—every little bit helps! We also finally got around to creating an online space for all you lovelies to share your thoughts and tips with one another, to which everyone can contribute. 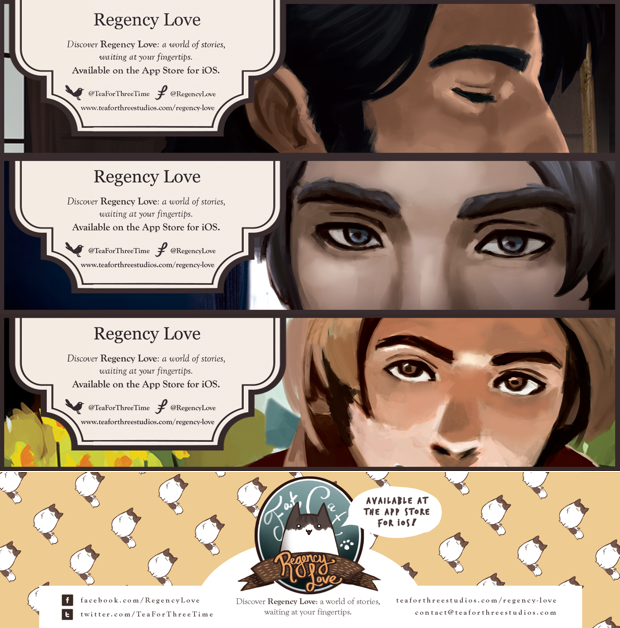 And so, we’re happy to present the Regency Love Wikia—please do check it out, and add anything you’d like to it. We’ll occasionally visit the pages to do a bit of house-keeping and to answer any questions to some of the more difficult things (such as how to obtain certain achievements), but for the most part, the Wikia is in your hands. We hope you’ll have lots of fun! We have received your bug and typo reports, and Melody is working on fixing them. Some bugs can be super sneaky, so they might take some time to hunt down. We are working on an iPad version, which will contain a new User Interface to maximise the screen space and make reading the text more comfortable. There is a related project in the works: something a little different, which we hope you’ll enjoy. More will be revealed in the next few weeks, when a few things are finalised. And finally, I’m giving a presentation about Regency Love at this year’s BSECS postgraduate conference. I’ll be filming the presentation so I can post it afterwards—there’ll be lots of behind-the-scenes and methodological shinies for those who are interested in some additional geekery. As always, thank you so much for your wonderful support. Until next time! Regency Love 2.0 is here! The ability to support Tea For Three Studios in a “Pay What You Want” fashion, through supporting and patronising various in-game characters. Although we have worked hard and done our best to deliver a flawless game, due to the limitations of time and resources, there are bound to be a few typos, bugs, or other errors. If you come across any of these, we ask you to report it on this post, and to be patient with us as we go about a fix. We would also love to know what you think about our game, so please either leave your thoughts on the Regency Love Facebook page, or tweet about it with the hashtag #RegencyLove (and feel free to mention @TeaForThreeTime if space allows). If you’re particularly keen on Mr Graham, then do feel free to use #GrahamMayhem as well. You would also have our heartfelt gratitude if you would share them with anyone you know—or don’t know—by leaving these in libraries, cafes, bookshops, classrooms, or anywhere else that takes your fancy. By doing so, you’ll be helping us expand our wonderful community, and thereby enabling us to create more content in the future. We would love it if you could take photos of the bookmarks you’ve left, and use the hashtag #RegencyLoving on Twitter or Instagram (and, for your reference, Samantha will be lurking on the latter as @lovelies8). But that’s enough from me for now—I’ll let Regency Love do the rest of the talking! We hope you’ll enjoy! P.S. Congratulations to the winners of our giveaway: Audie, Nina, and Sydney. Thank you all for participating!